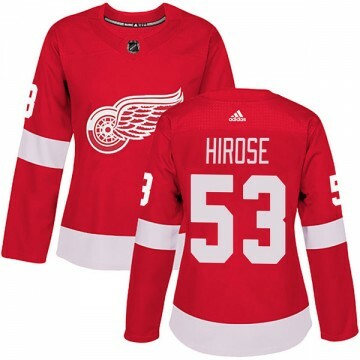 Let everyone know you're the #1 Detroit Red Wings fan when you sport this Authentic Adidas Women's Taro Hirose Detroit Red Wings Home Jersey - Red! The perfect complement to your Detroit Red Wings wardrobe, this jersey is sure to turn heads. Let everyone know you're the #1 Detroit Red Wings fan when you sport this Authentic Adidas Women's Ryan Kuffner Detroit Red Wings Home Jersey - Red! The perfect complement to your Detroit Red Wings wardrobe, this jersey is sure to turn heads. Let everyone know you're the #1 Detroit Red Wings fan when you sport this Authentic Adidas Women's Matt Puempel Detroit Red Wings Home Jersey - Red! The perfect complement to your Detroit Red Wings wardrobe, this jersey is sure to turn heads. Let everyone know you're the #1 Detroit Red Wings fan when you sport this Authentic Adidas Women's Madison Bowey Detroit Red Wings Home Jersey - Red! The perfect complement to your Detroit Red Wings wardrobe, this jersey is sure to turn heads. Let everyone know you're the #1 Detroit Red Wings fan when you sport this Authentic Adidas Women's Kaden Fulcher Detroit Red Wings Home Jersey - Red! The perfect complement to your Detroit Red Wings wardrobe, this jersey is sure to turn heads. Let everyone know you're the #1 Detroit Red Wings fan when you sport this Authentic Adidas Women's Justin Kowalkoski Detroit Red Wings Home Jersey - Red! The perfect complement to your Detroit Red Wings wardrobe, this jersey is sure to turn heads. Let everyone know you're the #1 Detroit Red Wings fan when you sport this Authentic Adidas Women's Jake Chelios Detroit Red Wings Home Jersey - Red! The perfect complement to your Detroit Red Wings wardrobe, this jersey is sure to turn heads. 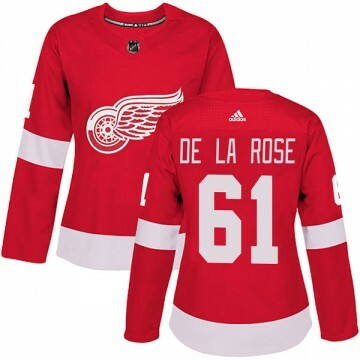 Let everyone know you're the #1 Detroit Red Wings fan when you sport this Authentic Adidas Women's Jacob De La Rose Detroit Red Wings Home Jersey - Red! The perfect complement to your Detroit Red Wings wardrobe, this jersey is sure to turn heads.